When I was choosing where to go on a winter holiday this year, the main criteria I set were that it had to be warm, sunny, have lots of wildlife, be easy to get to and would require the minimum amount of planning. With that list, Florida was an obvious choice. 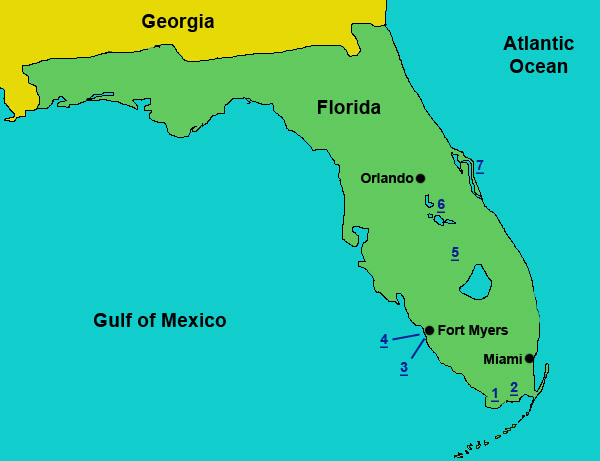 Southern Florida has a subtropical climate, where the night-time temperatures never dropped below 18C and maximum daytime temperatures around 25-32C in the Everglades in the week I was there. It was quite a bit cooler in the Orlando area, but daytime temperatures were still well above 20C most of the time. Another plus is that, being in the subtropical zone, the quality of light for photography in the early mornings and late afternoons is superb! Florida is without doubt the easiest place to photograph wildlife I have ever visited. The wildlife is generally extremely tame and approachable and even if you only have a medium-length telephoto lens it would be difficult to come away without tons of good photos. The clickable map below shows the rough locations of the most productive sites I visited.